Display the text as a block of code. Start each line of a code block indented at least four spaces or one tab from the indent level for the current delimiter. For information on indent level, see Quick Help Sections. There are empty lines above and below the code block. Enter four backquotes (`) on a line above and below the lines for the code block. The four backquotes start at the indent level for the current delimiter. For information on indent level, see Quick Help Sections. Lines 3-5 in the markup below result in the code block shown in the screenshot. 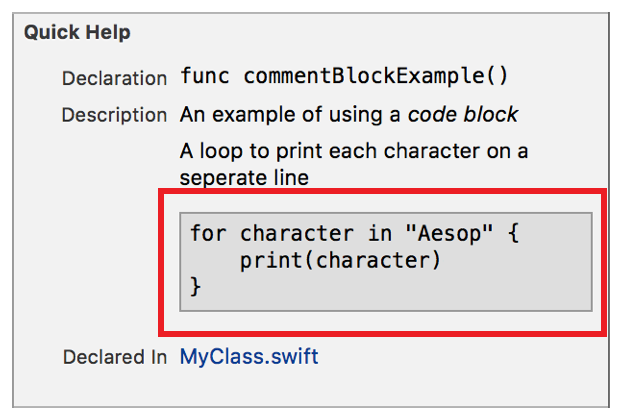 Lines 5-7 in each of the comment blocks below result in the code block shown in screenshot.